Everyone knows that I love to travel. 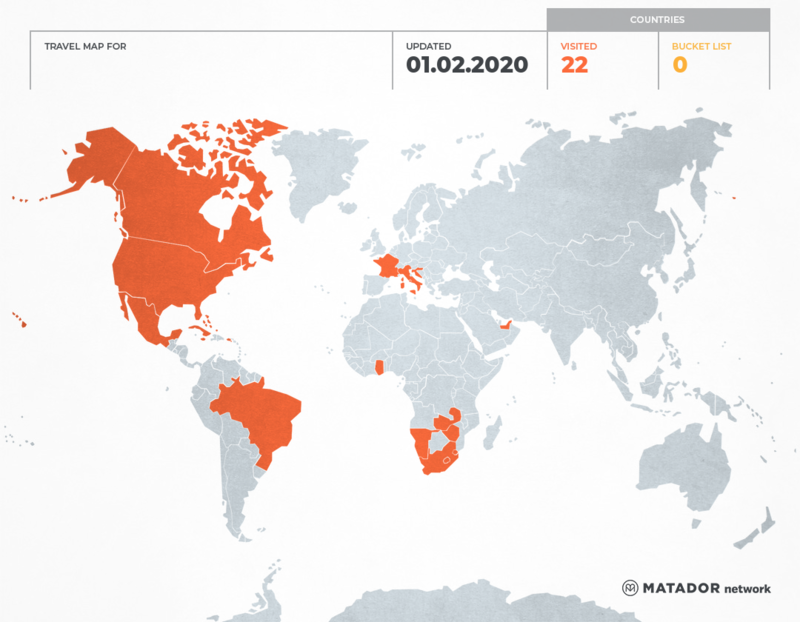 But the funny thing is, I’ve never kept count of how many countries I’ve visited — until today when #WhereMonicaGoes introduced me to Matador Network’s Travel World Map Generator. Come to find out, my number is 22. The Travel Sista has been to: Bahamas, Brazil, Canada, Croatia, Cuba, France, Ghana, Italy, Jamaica, Lesotho, Mexico, Namibia, Puerto Rico, South Africa, Swaziland, Turks and Caicos Islands, U.S. Virgin Islands, United Arab Emirates, United States, Vatican, Zambia, Zimbabwe. Looking at my travel map, I definitely need to explore more of South America, Asia and Africa. I’ll be visiting several new African countries this year. I think 2017 will be my year to go on a tour of Southeast Asia and see more of the Middle East. In the meantime, I look forward to plowing down more things on my bucket list and reaching my 6th continent this year – Australia. So, what’s your number? Please list your countries below or share your travel map. Get your own travel map from Matador Network. It’s easy and fun.